Want to chat about your local marketing? We offer free consultations! Looking to acquire new customers from your local area using local search, social and online review marketing? Look no further. Our Local Business Marketing program includes all the elements you need to succeed online as a small or medium-sized local business – SEO optimization, consistent content creation, online review management, social media and more! This program is a great fit for any local business that needs to attract more customers from their local market using Internet Marketing. This includes medical practices, chiropractors, home services and more. Using this program, local businesses create the strategy and consistency needed to succeed online. Just ask our clients! "We are getting more calls and adding new patients to our practice every month. We are very happy with the results!" Tired of Lackluster Results from Local SEO? For years, we’ve designed and managed online marketing programs for mid-market businesses with revenues of $50-100M. We’ve helped many businesses generate thousands of leads, resulting in sales in the millions. Now we’re able to bring this level of expertise to the local business market at an affordable price, starting at $1200/month, by offering a repeatable program customized for your business. 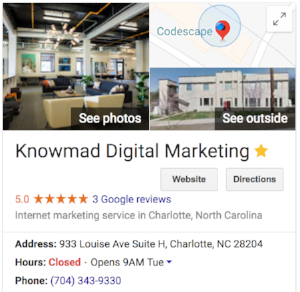 Our local business marketing program is more than just Local SEO. It’s everything you need to successfully market your business and existing website online, attracting qualified sales opportunities. To speak with us about your content marketing needs, request a free consult. One of our team members will contact you within a few business hours to schedule a free, no-obligation consult.